Drama. 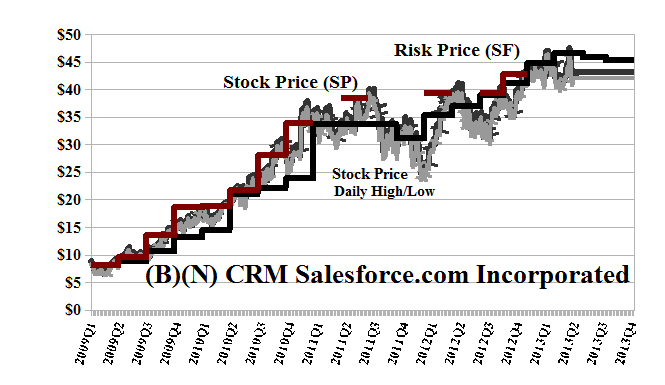 Salesforce is an evanescent dotcom product and software-as-a-service (SaaS) integrator with an impressive growth record from $10 in 2009 to the current $42 but is off our Charts since January, and might have to stay off as the Cloud thickens with tough competition from IBM, Oracle, Google, and Microsoft, and software applications that are getting ever-better and easier to use (Reuters, May 23, 2013, Salesforce.com’s quarterly results disappoint Wall Street, and The Street, June 3, 2013, Salesforce Slumps on Meager Dot-Com Era Profits). Despite a three-fold growth in sales from $1 billion to the current $3 billion, and a near four-fold growth in its total assets from $1.5 billion to the current $5.5 billion, the company has never paid us a dividend, and its net earnings have been negative for the last two years and very thin when positive at 4% to 5% of the gross revenue. Investors, presumably, are supposed to “hump” their way up and down the P/E-curve in the old fashioned way, and make money by selling the stock to each other so that the last guy in pays everyone else – a kind of Ponzi-scheme one would think. We’re not one of those, but we will play the game if the price is right; we only own the stock if the ambient stock prices summarized as the Red Line (SP) appear to be at or above the Black Line Risk Price (SF), and for no other reason. Please see Exhibit 1 and the References below. Salesforce.com Incorporated provides enterprise cloud computing solutions, offering social and mobile cloud apps and platform services, as well as professional services to facilitate the adoption of its solutions. From the Company: Salesforce.com Incorporated provides enterprise cloud computing solutions to businesses and industries worldwide. Its service offerings include Sales Cloud, which enables companies to grow their sales pipelines, close deals, improve sales productivity, and gain business insights; Service Cloud that enables companies to connect with their customers and address their service and support needs; Marketing Cloud for its customers to listen to conversations taking place on public social networks, such as Facebook, Twitter, and blogs; and Salesforce Platform, which enables its customers, independent software vendors, and third-party developers to develop applications in various programming languages, including Java and Ruby. The company also offers professional services, including consulting, deployment, and training services to its customers to facilitate the adoption of its social and mobile cloud solutions. Salesforce.com Incorporated sells and markets its services on subscription basis primarily through its direct sales force comprising telephone sales personnel, as well as through global consulting firms, systems integrators, and regional partners. The company was founded in 1999 and has 9,800 employees, and is headquartered in San Francisco, California.